Hello Pretty Providence readers! 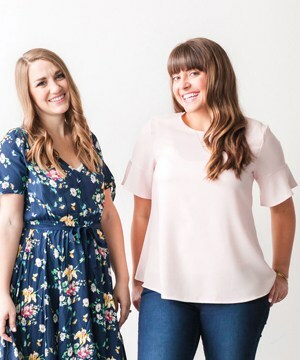 I’m Bethany, from Whistle and Ivy and I am so excited to be sharing with you today. I know it’s not even Valentine’s Day, but I already have my heart set on springtime. I have big plans for an awesome garden this year, but since it is still too early to get outside and enjoy the weather, I will have to settle for bringing springtime inside. 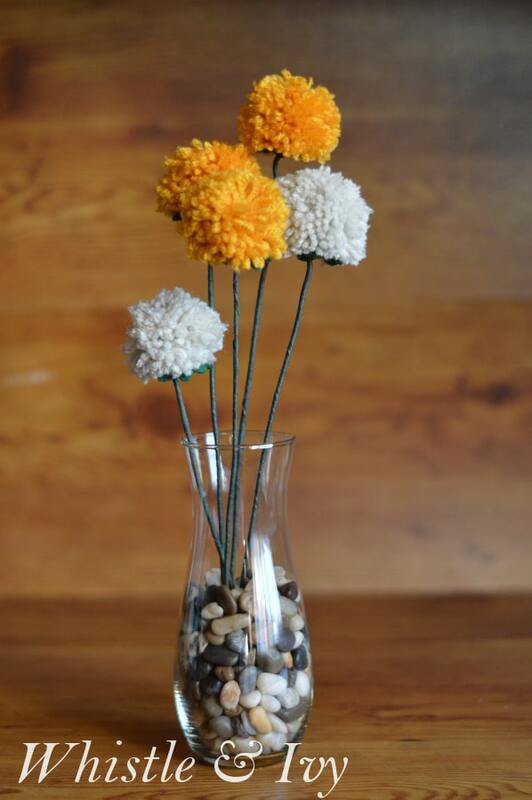 These shabby chic pom-pom flowers bring a pop of color and springtime cheer to our front room and they were incredibly easy to whip up. Start with your pom poms. 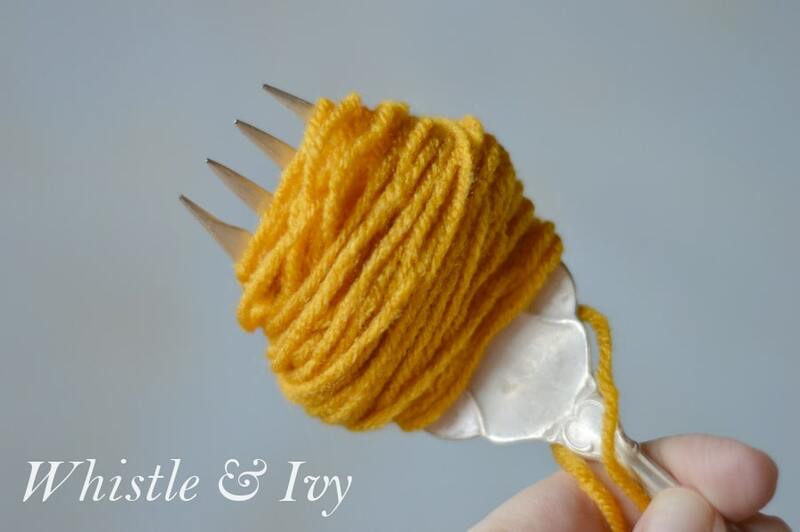 You can make them by wrapping yarn around your fingers, but I like to use this big fork I have, it keeps my hands free to tie them later. 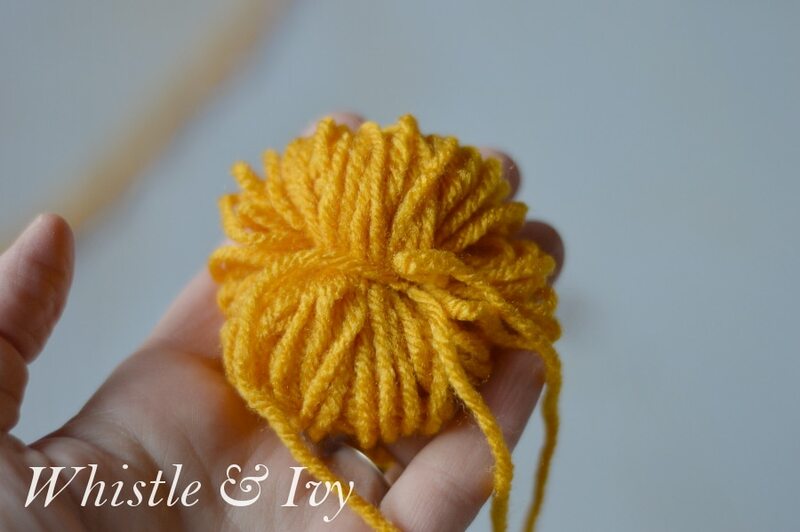 Wrap the yarn WAY more times that you think you need to, then tie a second piece of yarn tightly around it. To finish the pom-pom, cut the loops and trim the ends until they are even. This part is my favorite! 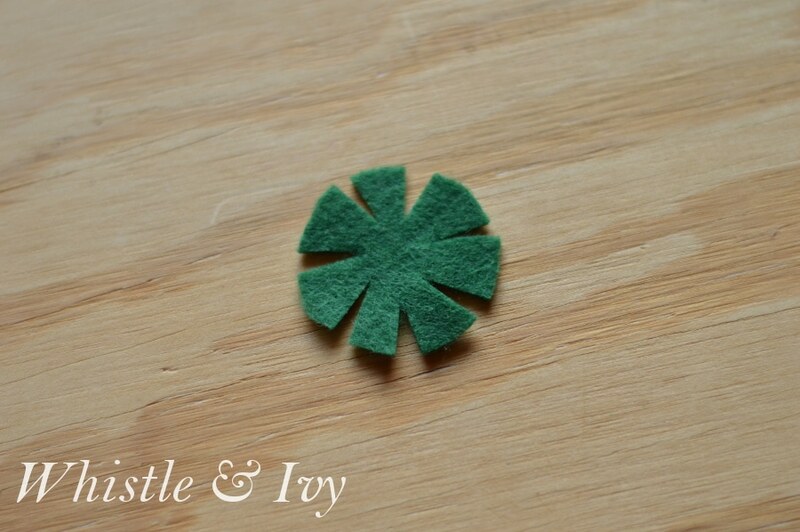 Once you have your pom-poms finished, make the greenery by cutting small circles of green felt. 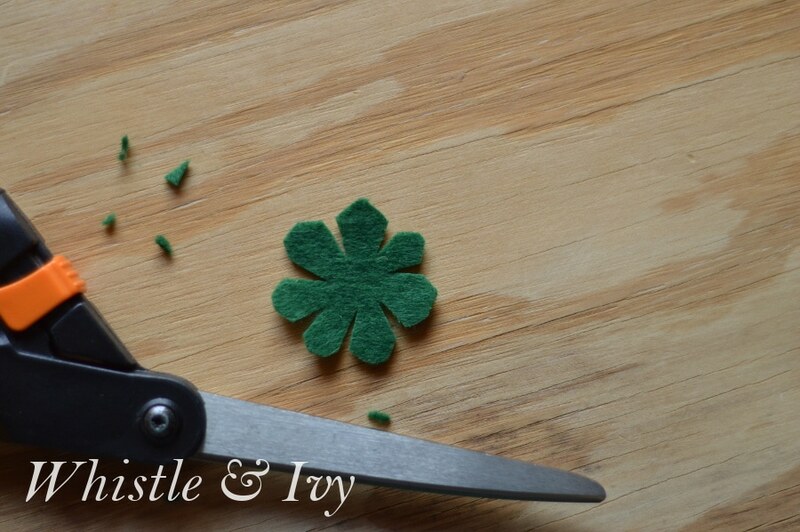 Then make small cuts to give it “leaves”. Trim the tips to make them roundish and more natural. 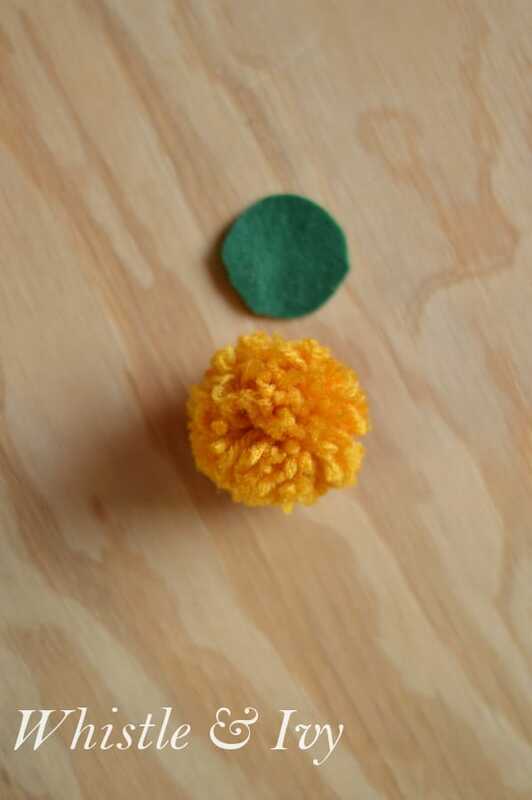 Using hot glue, attach the greenery to the bottom of each pom-pom. 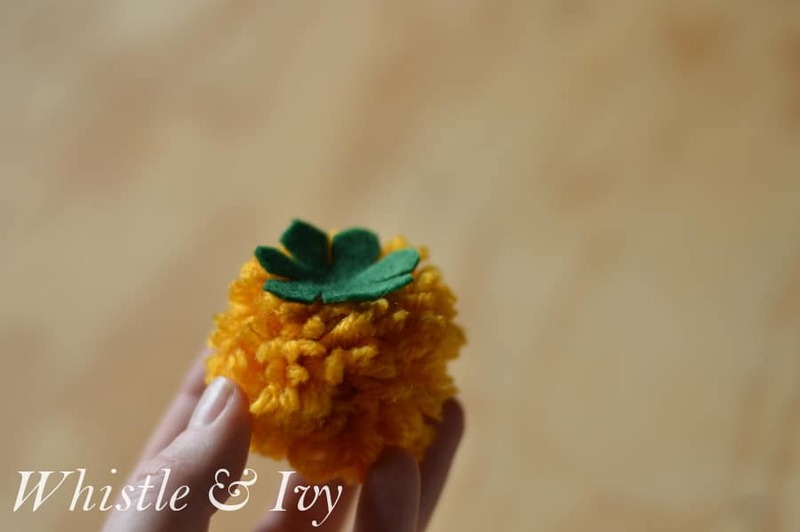 I didn’t glue the very ends of the leaves down, but make sure you have a good portion of it glued so the pom-pom is sturdy instead of floppy. Next, turn your wire into a stem by wrapping it tightly in floral tape. 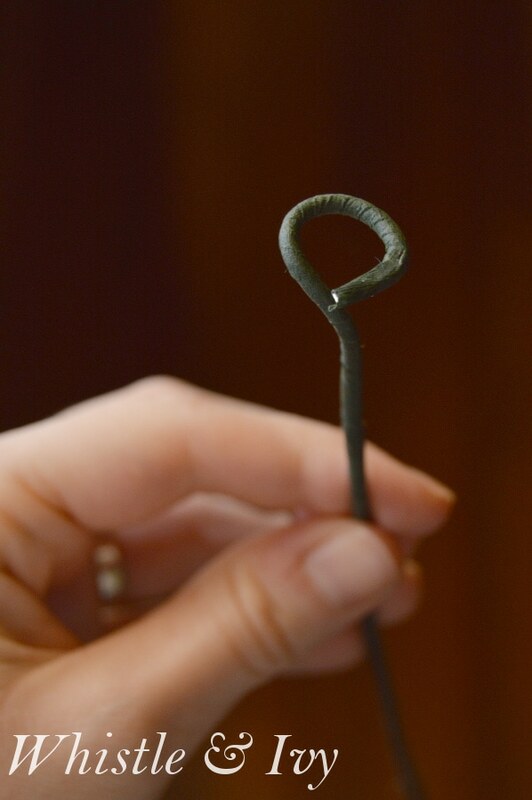 Once it’s wrapped, use your pliers to bend the top into a spiral shape. This gives it a sturdy edge to glue the pom-pom to. 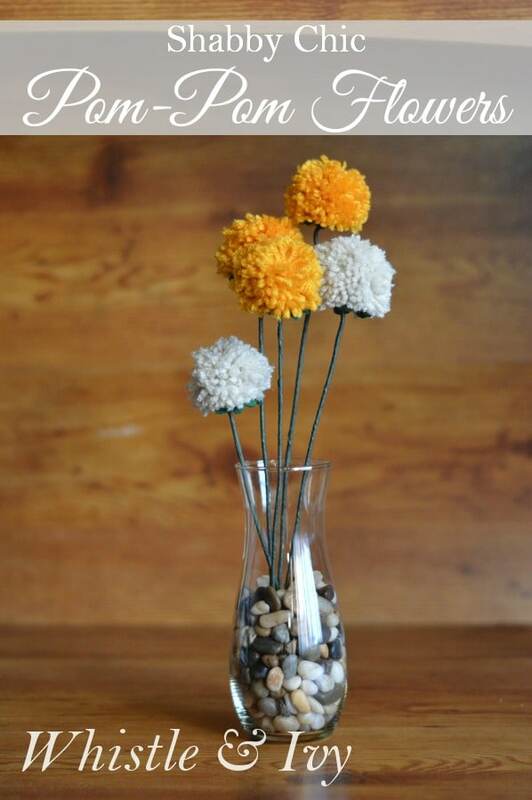 Using hot glue, attach each pom-pom to a stem. I made some off-white ones, and I love the mixture of color. Thanks so much for reading, and I hope you give these pom-pom flowers a try! I love they way they brighten our home. Don’t forget to subscribe to my blog and follow on instagram and pinterest! 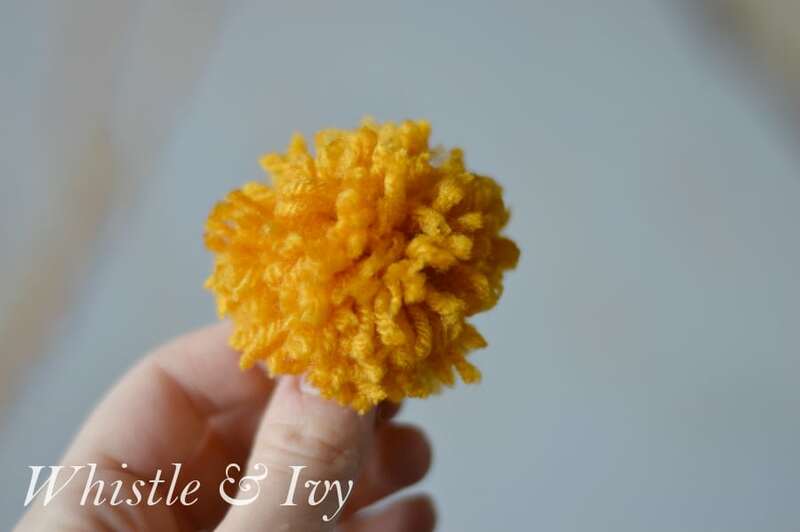 I’ve been making pompoms all week. I think it’s therapeutic. I’m also weird. These are so cute! And the tutorial is great! I may just have to go buy some yarn and make these this weekend. These are seriously super cute! What a creative idea! I can’t wait to make some of these. Best part is I already have all the materials in my closet! Thanks for the idea! Pinned! New follower from over at Penniesintopearls.com. Excited to see more of your cute ideas!